Plans by Nigeria’s fastest growing Legal professional network, thelearnedfriends.com to host her maiden edition of the E-Legal Conference 2015 has been concluded. The conference is scheduled to hold at 10 a.m. on Thursday 9th of July, 2015 at the Lagos Court of Arbitration and ADR, 1a, Remi Olowude Street, Lekki, Phase 1. The theme for this year’s conference is Tomorrow’s Legal and the primary objective is to provide thought leadership for the Legal industry on ICT solutions. Key players in the ICT and Legal industry from around the world will enlighten delegates on the latest enabling tools and software developed for today’s Law Practice. Expert speakers include but not limited to Mark Slade, British CEO Ringier Digital Marketing; Senibo Bara-Hart Legal Adviser, Samsung - West Africa and Azubuike Ezenwoke, Dean-Student Affairs, Covenant University. Barrister Alex Mouka LLB, BL, LLM, ACIArb, who is the current chairman of the NBA Lagos branch will inaugurate the conference as the keynote speaker. Those expected to participate in the E-Legal conference include Policy and legal professionals, paralegal professionals and ICT professionals. Interested participants are to visit www.elegalconference.com for their registration details. TheLearnedFriends.com is an online news aggregator and social media platform focused on showcasing technological innovations in the Legal Sector. 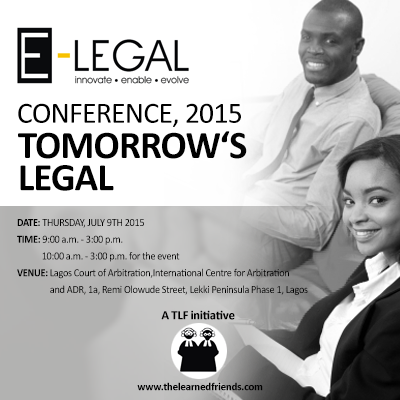 Her mission is to generate commercial value for Law people by leveraging on Information and Communications Technology.